You've seen them in print before, and their books are hot, hot, hot! 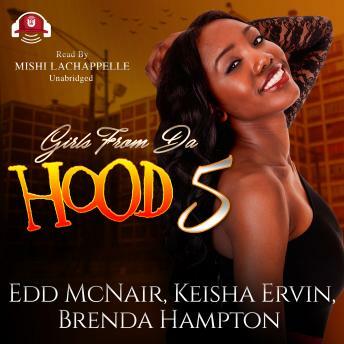 Now see what Edd McNair, Keisha Ervin, and Brenda Hampton can do when they join forces to bring you three stories in the latest installment of Girls From da Hood.Being married to notorious gangsta rapper Sean Pynn isn't as glamorous as it appears to be. Behind closed doors, Queen is dealing with knock-down drag-out fights, verbal abuse, and neglect. When her bodyguard, Ahsim, comes into the picture, things change in a hurry.When a man thinks his woman is cheating, he keeps tabs on her. When a woman thinks her man is cheating, she calls Jakki. Rochel "Jakki" Thomas' way of catching a man in the act is a little risky, but she's worth every penny.Niecy Brickhouse and her twin sister Naquel are living the glamorous life-until Naquel is shot by their older sister's boyfriend. Everyone is calling it a suicide, but Niecy knows the painful truth about her sister's death, and it sets her on a dangerous, self-destructive path. Will she be able to overcome her depression, or will her new life on the streets be the death of Niecy?